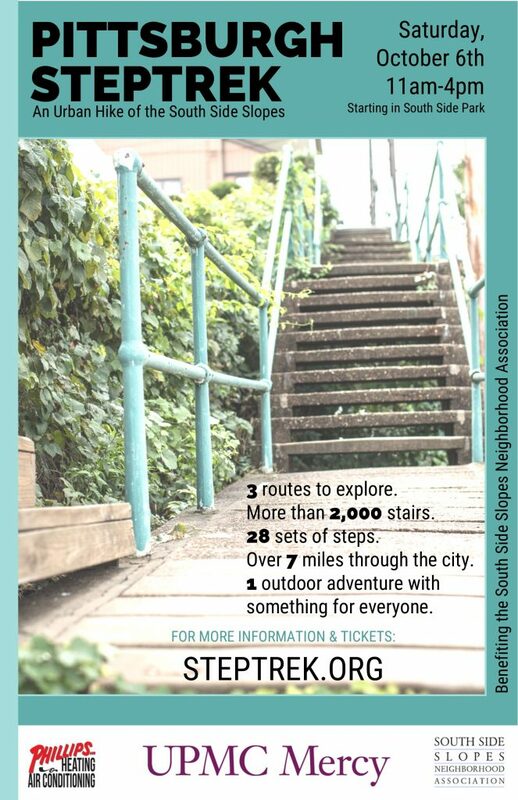 South Side Slopes Neighborhood Association | "neighbors working together to make the Slopes a more livable, beautiful, and safe community"
Every year, the South Side Slopes Neighborhood Association holds six public meetings open to the community (two of which are parties!). All meetings start @ 6:30 p.m.
All South Side Slopes residents are invited to attend. Join us to meet new people or reconnect with long-time neighbors, learn what is happening and planned for the community, and share your ideas, concerns and love for the Slopes. In order to be a voting member of the South Side Slopes Neighborhood Association, you must attend at least 2 meetings and/or events per year. StepTrek is Saturday October 6, 2018! On Memorial Day weekend 1998, there was a fire in a home on Holt Street that destroyed three homes in the time that it took the Fire Department to arrive and stage their equipment. Due to the unique topography of the South Side Slopes, narrow hilly streets and tight corners, the fire won. Because of this, a group of active Slopes neighbors were galvanized. Throughout the summer, several meetings were held and by October 1998 a Board of Directors was chosen and the South Side Slopes Association was born. The initial slogan was “SOS/Save Our Slopes”. Thanks to the partnership with the Pittsburgh Bureau of Fire, the Firefighter’s Union and several Fire engine manufacturers, within a year, the City had the plans to order 4 smaller pumper trucks with a tighter turning radius and narrow wheel span to safely travel all of the hilly City neighborhoods, not just the Slopes. This was ambitious and the Board was focused. Keep in mind that the internet of 1998 was not what it is today. We got our first “AOL” email address in 2002, followed by our first website, later that year. SSSNA also became a member organization of the South Side Planning Forum. We gave input for the South Side Works development and participated in the new land use designations of MAP Pittsburgh. We attended City zoning hearings and invited developers with plans to build/restore in the Slopes, to share their plans and get our input from the community at our meetings. We began long‐standing relationships with City, County and State agencies and officials, as well as the Pittsburgh police. Many of the City partnerships and projects involved public safety. In 2002, we worked to get two pedestrian footbridges over the railroad tracks at 10th and 15th Streets replaced with Core ten steel, adding safety lighting three years later. We also had safety lighting installed under the railroad underpasses on 18th, 21st, 22nd, 23rd, 24th, 26th and 27th Streets. Another big focus was, and still is, beautification. We began gateway garden developmental by partnering with the Western Pennsylvania Conservancy (WPC). We built gardens along Josephine Street at Greeley and Barry Streets in 2000. More gardens followed along 18th Street, then Brosville and continue to be created throughout the Slopes. There were thousands of cleanups over the years that continue today. Thousands of discarded tires have been removed, as well as tons of trash and recyclables. What was our most successful, hair‐brained idea? StepTrek. While other neighborhoods had home tours, we knew that the Slopes was unique and should be showcased differently. 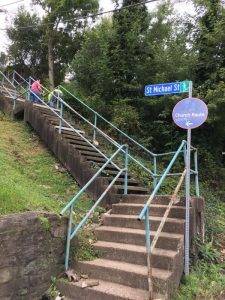 Author Bob Regan and photographer Tim Fabian were collaborating on a book (The Steps of Pittsburgh: Portrait of a City) about the public stairways throughout the City – which would create some buzz about the steps. Slopes residents Ed Jacob and Mike Milberger brought an idea to the board that the City steps should be celebrated. The fledgling board decided to give it a try, and StepTrek was a go. 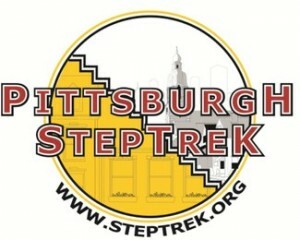 In 2000, we held the first StepTrek. Hundreds of people paid money to walk miles of steps – for a good cause. We got the City to repair steps and clean up the routes each year prior to the event. We changed the routes every year to keep up maintenance on all of our stairways. Now in its 18th year, StepTrek has enabled thousands of people to experience the amazing views that we get to see every day. It has been an amazing journey. It is hard to imagine 20 years ago how much would be accomplished. The loss of homes to the fire in 1998 was terrible, but from that tragedy came a community focused on safety, advocacy and continuous improvement. Since 1998, the SSSNA board has had dozens of amazing neighbors who have served and added to the energy and progress of this community. Thank you to all who served, partnered, volunteered, cleaned, photographed, documented, shared, trekked and donated. The success of SSSNA and the neighborhood is because of you! Cheers to the next 20 years! Here are the (actual) dates for the 2018 South Side Slopes Neighborhood Association General Meetings and Parties! 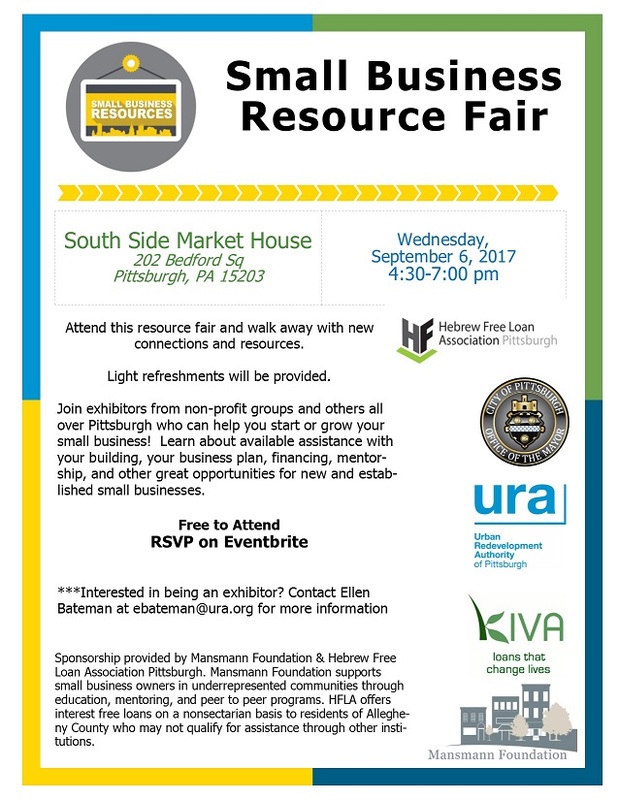 All South Side Slopes residents are invited to attend. Join us to meet new people or reconnect with long-time neighbors, learn what’s happening and what is planned for the community, and share your ideas, concerns and love for the Slopes. Welcome to Jamie Balser to the Board of the South Side Slopes Neighborhood Association. 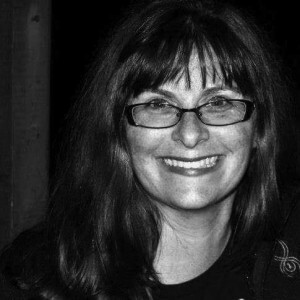 Jamie has been a vocal and active participant in the Friends of South Side Park and many many volunteer days for South Side Park and other Slopes events. Dawn Lorincy, Denise Filip, Dawn Lorincy, Brian Oswald, and Cara Jette were re-elected for additional 2-year terms as well. Thank you to Elizabeth Heidenreich for her year of service on the Board! Pittsburgh’s public stair network is comprised of more than 700 staircases which vary in size, age, construction material and condition. Join us at our citywide kick-off meeting to learn about the project and provide your input on how these treasured assets should be repaired and maintained! Come and learn about the Western Pennsylvania Conservancy’s plans to transform South 21st Street with trees, grasses, bioswales and pedestrian improvements. They will present concept designs and seek feedback from you, your friends and neighbors to help inform the final design. Light refreshments will be provided. Registration is not required. For more information, please email 21street@paconserve.org. When: Tuesday, February 28, 2017 at 6:00 p.m.